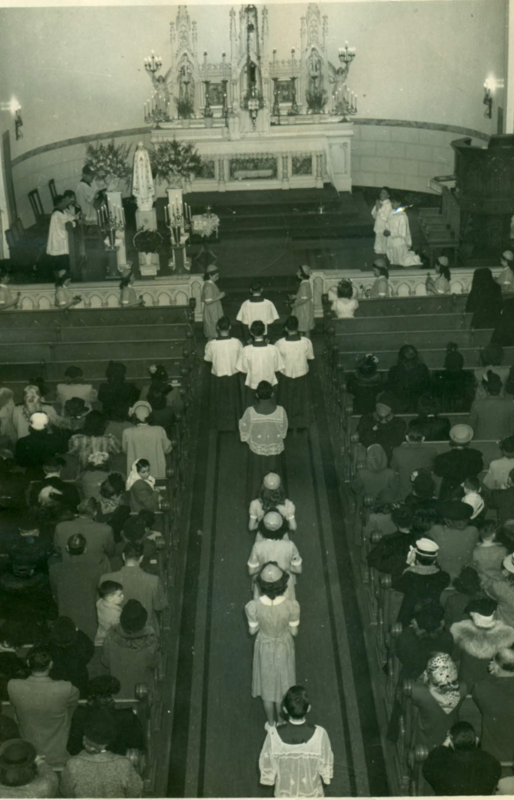 The founding of St. Philip the Apostle Church and Parish in 1910 satisfied the needs of a growing Roman Catholic Community in the Upper Noe Valley. There are two symbols that grace the sidewalk and street in front of the church. The shamrock painted Kelly green on the sidewalk and the matching green divider stripe on the street are a reminder of the large group of Irish families who shared this part of the Valley with their German neighbors. San Francisco grew rapidly after the devastation of the earthquake and fire and Noe Valley neighborhood began to fill up quickly. 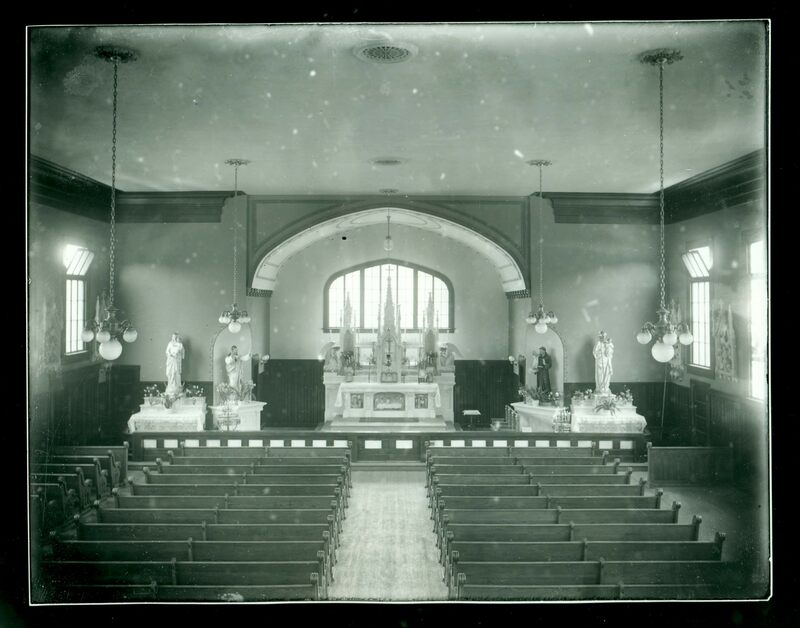 However there was no Catholic church in the area and to fulfill their religious obliations it was necessary for parishioners to travel more than a mile to hear Holy Mass. In 1910 the Most reverend Patrick W. Riordan, Archbishop of San Francisco called an Irishman, the Rev. John J. Cullen and gave him instructions to found this new parish in San Francisco. Father Cullen traversed the heart of the proposed parish and parts of its outskirts making a cursory map of its boundaries lost no time in founding St. Philip's parish. The parish rented an old workshop and converted it to a chapel. 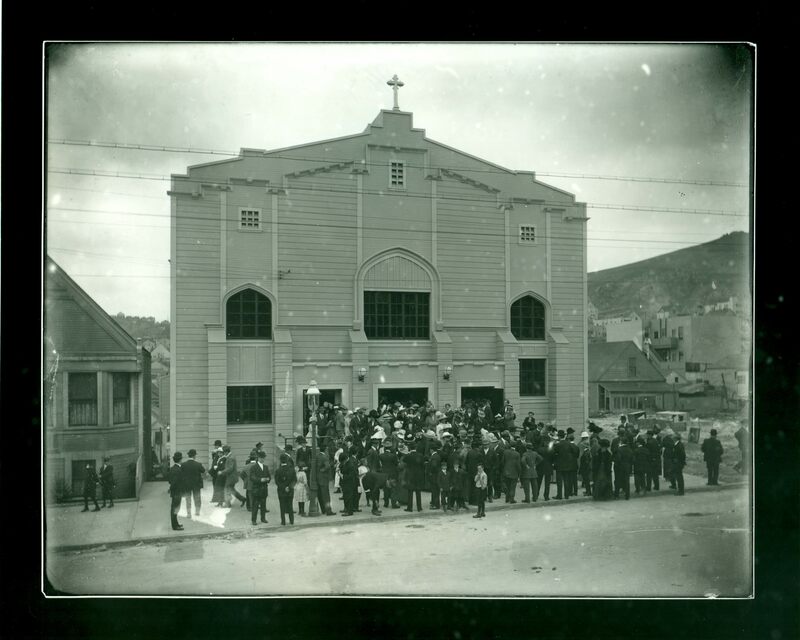 A lot was later purchased at the corner of Elizabeth and Diamond Street and a temporary church was built on Elizabeth Street in 1912. The parochial residence on Diamond was completed in 1913 in the late gothic style, now altered. The church was later converted to a school and another building named the Large Hall used as the sanctuary. Construction of the current church building was begun in 1925. John J. Foley is listed as Architect. The style is Gothic Revival with asymmetrical towers at each side supported by pier buttresses. The gothic arched entry is recessed with deeply paneled and ornamented hardwood doors. Upon entering the nave you notice the barrel vaulted ceiling supported by large Corinthian topped marbleized columns. The columns form a perfectly symmetrical space and separate the center from each side. The North and South rows of five Columns are separated by gothic arches each with an original hanging lantern. The arches are symmetrically aliened with the gothic arched windows enclosing stained and colored glass images of selected Saints , The Virgin Mary and Jesus. Under leadership of the then Father, Jerome Hannigan, who was musically inclined, the new church has two choir lofts in the transept to facilitate antiphonal signing. Above and below the choir lofts are beautiful windows depicting Christ in the garden, Christ on the cross, Christ ascending, and Mary the mother. As a result of The Second Vatican Council (1962-1965), the altar was changed in 1964 to face the people and it was considerably simplified. The main altars and side altars of Carrara marble match in a modern style. The church school on Elizabeth Street and convent on 24th Street were built in 1938 in the Spanish Colonial architecture of Mexico by noted architect Martin Rist. Mr. Rist was the Architect of St. Cecilia's at Seventeenth Avenue and Vicente which is Mexican Colonia Revival and Romanesque in style. The Father John R. Cantillon, also an Irish native, started Whist card games to raise money for the school and they became a very popular social event in Noe Valley.